The inverted bows and flat bottoms limit pitching under sail. Flat bottoms also bring good lift, and hull shines improves anti drift effect. Depending on performance / practicality specs, as chosen by the owner, appendages are selected among long keels or dagger boards for upwind capability, beaching keels, propellers’ protection skegs, …. The rudder positions are optimised for manoeuvrability. Aft beam can be equipped with either standard davits or specific equipment such as a mobile platform or large gangway. In day charter version, the Day 1 can be equipped with 1 or 2 helm stations . Most sailing operations are centralized at the helm station(s) and mast foot. 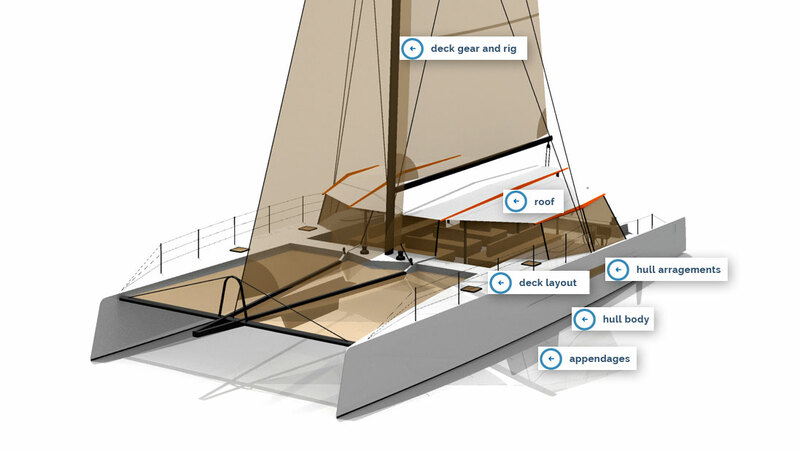 The mainsail is defined according to the cost/performance targets of the ship owner: square top or classical shape. The head sails are also tailored: classic or self tacking jib, bowsprit for downwind sails. The choice of materials and equipment is adapted to the investment/performance ratio of each project. The ergonomics of aft transoms is carefully designed for ease of circulation: the aft deck is a flat single level with no aft beam to step over. On the transoms, a swivelling piece of outside bulwark serves as a gangway. Large surfaces are dedicated to passengers.. there are 2 deck configurations : either the main deck is an even single level surface, or hull decks are higher than platform deck, creating peripheral seating arrangement. Then, access to forward decks is either by lateral passageways or openings doors at the roof front. Forward fore-and-aft structure is either made of two « V » beams, with bowsprit extension outside the crossbeam, or parallel beams with a foldable stair for bathing and boarding operations. Engine room accesses are easy. Arrangement and furniture are customised to the requested number of passengers, and specified level of comfort. With bimini-like construction, optimised aesthetics but light structure, the roof is modular in each direction. The view is 360° thanks to extensive clear enclosures made of crystal, plexiglass or glass. They can be fixed or foldable. The roof itself is à la carte, canvas or rigid, clear or solid, etc… Flybridge is an option, for passengers and/or manoeuvring. Here the same ‘custom philosophy’ applies : for pure Day Charter, the hulls are fitted with large toilets. Access is easy via fore-and-aft wide, nicely slopped and protected stairs. In the hulls there are also very large storage rooms with shelves, both for boat and crew operations, and for passengers’ personal belongings. In the Open Cruise version, each hull can be fitted with 1 or 2 double cabins, plus toilets. This arrangement gives large storage rooms in the forepeaks and aft peaks. The bar and galley are located on the platform, under the roof. The engines are selected in close cooperation with the ship owner, for power, rating, classic or hybrid arrangement. Each ship is designed and equipped according to the specific regulations that the ship owner must conform to: NUC, passenger ship, local regulations.